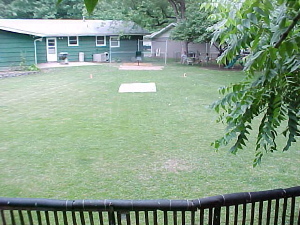 Shortly after moving into my home in Ferguson, Missouri, the creation of the Thies Wiffleball Stadium became a reality. 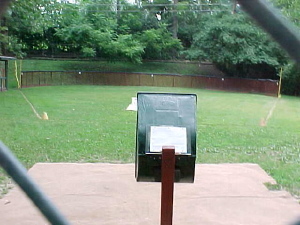 The stadium featured a Homerun Fence, Backstop, Permenant Home Plate and paved pitching and batting areas. In addition to the neatly kept Wiffleball Stadium, we record the statistics for all of the games played. The rules varied slightly to make use of the trees and other obstacles that the field had to offer. 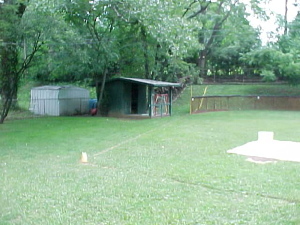 The Wiffleball Field dates back to 1987 and had seen nearly 1200 recorded Wiffleball games. 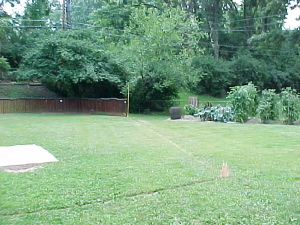 In 2006, the field was restored to a back yard as a car accident prevented me from participating in the sport any longer. 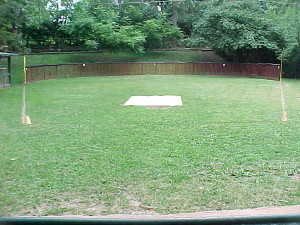 View from Home Plate looking out to the field. 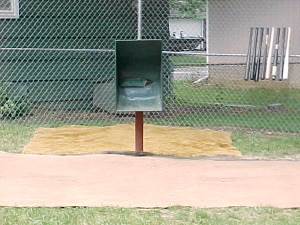 Close up of the Batting Area. View from the Center Field Hill. View from behind the Backstop. View down the Left Field line. View down the Right Field line.